Rachel is in town from New York, helping to develop Lauren Weedman's new one-woman show. When Rachel and I are together, we're all about stalking celebrities, or at the very least, spotting them. And what better place to do that than Hollywood! Tickets to the new Jackie Mason stand-up extravaganza at the beautiful Wilshire Theatre landed in Rachel's lap, so she decided to drag me along. We entered very skeptical because, after all, Jackie Mason is 76 and loud and always shouting "Jew, Jew, Jew!" or something to that effect. Because the idea of Jackie Mason spitting at us was unappealing, we handed the "A"-row tickets to Lauren, and Rachel and I took "D."
Because the bio in the program for Jackie Mason was two pages long (four columns, single spaced), Rachel read the first half while I read the second half and we summarized what we read for each other. 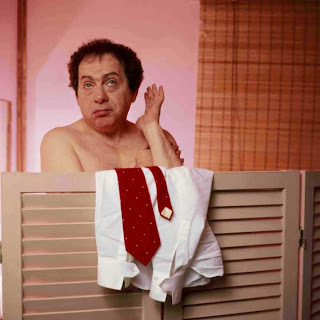 Jackie Mason has had a very illustrious career, spanning many countries and continents, spewing out his brand of offensive and political humor, all with a big ol' Jewish bent. I almost fell asleep during the show's first half, which was a lot of "the difference between Jews and Gentiles" jokes. I am neither, so I didn't really connect. Plus, the guy sitting in front of me took off his shoe and sock and started stroking his foot. The second half of the show fared better for me, as his aggressive political comedy made me laugh. But I couldn't laugh too much of course because I was too busy thinking about how, during the intermission, we found out that the seats we gave to Lauren were right next to Jamie Lee Curtis and Christopher Guest. "Damn you!" Rachel and I shook our fists at the heavens. According to Lauren, Jamie was laughing hard and clapping her hands and having a grand old time, while Christopher sat mostly silent. During the show's second half, I kept looking out for Jamie and Christopher, but I think they left during the intermission. I guess Christopher won that battle. Larry David was also seen skulking about, but I didn't catch a glimpse of him either. So it was a bust for Rachel and me. Except we saw Jackie Mason. "I can tell you're a Gentile, 'cuz your clothes don't match." "Damn you!" Shake, shake, shake.